Deveneys of Dundrum: July Tasting Synopsis. The turn-out was really good on Thursday. Thanks for making the effort and no difficult questions! !- Fantastic. For future reference I'm not all about the hops and fermentation process. If it tastes good I'm a fan. We tasted all these to your left and 2 fruit Lambics. Surprisingly enough I heard a few 'That's really nice' and I was the only girl - quashing all previous notions that they're only chick beers. I love the idea behind Summer beers. 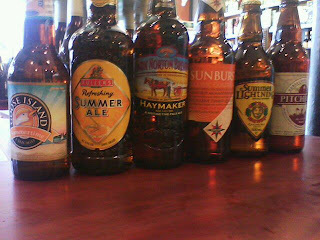 They're brewed to reflect sunny days and everything you associate with the warmer season. For us obviously, this means holidaying abroad. Goose Island Summertime. Clean and kinda larger-ish in style, I was a little disappointed. I expected Silver Strand in a bottle. Biscuity, grainy nose with a savoury bready palate. I'm quite happy for them to make this only once a year. I love what Goose Island do so maybe I expected a little too much. Fuller's Summer Ale. I liked this. Light and fresh, the palate was malty with some nice fruit. Easy drinking Sunday avo beer. Hook Norton Haymaker. This was in my top 3. Higher in alcohol than the other 5 hence the slightly sweeter mouth feel. Fruit and biscuit with a nice carbonation. Dark star brewery, Sunburst. This did remind me of beers on a summer day. Citrus and grapefruit with fresh acidity on the finish - really nice. Summer Lightening - Hopback brewery. A little boring, heavier in style than the previous 4. Malty, hoppy aromas with a dry biscuit finish. Pitchfork by RCH brewery. Single malt beer but lighter than expected. Hops and dried fruit flavours under the biscuit notes. The last 2 were, Chapeau apricot and Chapeau Banana. These were samples and are not available in Ireland. I have ordered pineapple, strawberry and peach from Chapeau and they will be in at the beginning of August. I think I made the right choice. The apricot was slightly less sweet and had a higher acidity level that the banana with a slight nuttiness on the palate. The banana was almost too sweet and had a creamy palate which added to the sugar impact. I think Lambics need a high level of acidity to balance the sugar content. Interesting but even too capri-sun in style for me. Good to see you all and hope you'll make the August night. Hoping to have some really good German wheat beers for our August meeting.